Legal Ethics Defense Attorney Anthony Radogna Uses His Previous Experience as an Investigator with the State Bar to Help Attorneys through State Bar Complaints, Investigations, Trials and Appeals. “Attorneys aren’t always willing to talk to one another when they find out they are being investigated by the State Bar,” says Anthony Radogna Esq., LL.M. “The natural reaction of many attorneys upon receiving notice that a complaint is being investigated, is to handle the issue themselves. But the State Bar is completely different from what attorneys are used to in the criminal or civil setting. It is even vastly different from any other administrative court process as well. The State Bar has its own unique rules, court process and court system,” he adds. For his part, however, Radogna has experience with the State Bar in spades. Indeed, Radogna spent more than five years as an Investigator for the State Bar of California’s Office of Chief Trial Counsel (OCTC) investigating a wide range of ethical complaints brought against attorneys. He also served on specialized task force teams, and gained experience investigating the unauthorized practice of law, abandoned law practices, disbarred and resigned attorneys, and other activities such as drug abuse and physical or mental illness. After he left the State Bar, he decided to make it his mission to defend his fellow attorneys from precisely those types of investigations. “My niche is representing attorneys when there is a State Bar investigation opened based on a complaint made to the State Bar. Complainants usually come from the attorney’s own clients, but sometimes come from opposing counsel. Others may be opened based on referrals from courts or law enforcement agencies,” Radogna explains. In this very unique niche of legal practice Radogna says he’s found his calling, even though he never even intended to work as a practicing attorney. After earning his undergraduate degree, Radogna pursued a career as an insurance claims adjustor, while deciding whether or not to apply to law school. “As an adjuster you occasionally come across fraudulent claims and that sparked my interest in becoming an investigator,” he recalls. Thus, when the time came in law school where Radogna watched his classmates gun for internships with various firms, by contrast he was seeking out investigation jobs with the state and the county. He found precisely what he was looking for at the State Bar. “As an investigator, I reported directly to State Bar prosecutors. I collected witness statements, collected and subpoenaed documents, conducted field interviews, and essentially reported everything to the prosecutors who then determined how to proceed with a complaint,” he says. In time, Radogna was ready for a change, but he admits that even with all of his intimate knowledge of how the State Bar handles complaints, investigations and charges, he had no plans to practice State Bar defense. “I opened a general practice firm but quickly found that helping attorneys was my calling,” he says. It was during the first year of launching his general practice firm that he began to receive calls from friends and colleagues asking him questions about ethical rules, and requesting advice for their own practices. But one specific call would solidify his future path. “I got a call from a colleague asking if their friend could hire me to represent them in a State Bar investigation. It felt natural to me to respond to the allegations, and then enter into negotiation with people from the State Bar who I not only respected, but felt comfortable with. In that first case, I was able to get their complaint closed before the Bar took steps to file charges with the State Bar Court,” Radogna recalls. “That was the start of my niche law practice in State Bar defense,” he explains. During most initial consultations with clients, Radogna explains in complete detail how the complaint, investigation and/or charges will proceed within the State Bar. “I think like an investigator, I know what they need for their investigation and I use that knowledge to defend my clients using a specific strategy to beat the Bar’s case,” he says. His services include drafting written responses to the analyst or investigator with the goal of having the complaint resolved prior to the filing of charges, and includes all pretrial, trial and appeal work as well. 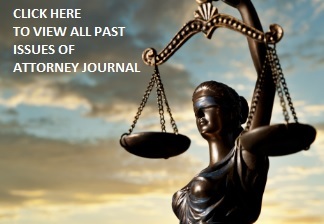 In addition to representing clients with their State Bar complaints, Radogna also provides representations in the areas of moral character/admissions, reinstatements after resignation or disbarment, and tailored counseling in the areas of ethics based on Radogna’s experience and knowledge of both the California Rules of Professional Conduct and the State Bar Act. Although Radogna may be amongst very few attorneys practicing in this field, he is quick to point out that he is in excellent company, and intends to stay in the field. “The attorneys who work in State Bar defense are amazing. Everyone is so open to helping each other and we talk regularly via email, message board, or by phone. It’s not cut-throat or competitive. It’s a very friendly group, all of whom really want to help their clients through tough situations,” he says. These days, Radogna is enjoying his burgeoning business, and looking forward to putting his LL.M to use teaching in the near future. “I really like this work. I think one of the most important things I can do is use my own strengths when pursuing the job that the client hired me to do. I know one of my main strengths is helping attorneys through the inquiry and investigation process. The process can be stressful and scary for an attorney who, for the first time, has received a letter from the Bar. My priority is to try to get the complaint closed during the investigation stage of the complaint, so that my client can avoid the costs of trial, and the risk of possibly receiving greater discipline,” he says.